SINGAPORE - All 16 town councils had unqualified financial statements for the past financial year except for Aljunied-Hougang Town Council (AHTC), said the Ministry of National Development (MND) in a statement on Friday afternoon (Dec 14). AHTC's financial statements were qualified by its external auditor because of an internal control weakness, where the town council did not record expenses incurred in a timely manner. "This is the seventh consecutive year that AHTC has received qualified statements from its external auditor," MND said. The ministry has presented the audited financial statements to Parliament. Town councils will also be making the statements available on their websites. In an unqualified report, the auditors conclude that financial statements present an organisation's affairs fairly in all material aspects, whereas a qualified report suggests that this is broadly the case, except for a specified issue or two. On Friday, MND also released the Town Council Management Report for financial year 2017, which ended on March 31 this year. The report looks at how town councils have performed in five areas: estate cleanliness, estate maintenance, lift performance, management of arrears in service and conservancy charges (S&CC), and corporate governance. Town councils receive either green, amber or red scores depending on their performance, which is assessed based on measurable objective criteria submitted by town councils and their auditors. All 16 town councils scored green ratings in estate cleanliness, lift performance, and S&CC arrears management. However, five town councils - Aljunied-Hougang, East Coast-Fengshan, Jalan Besar, Jurong-Clementi and Tampines - scored amber for estate maintenance. This means that there were between four to seven counts of maintenance observations per block. 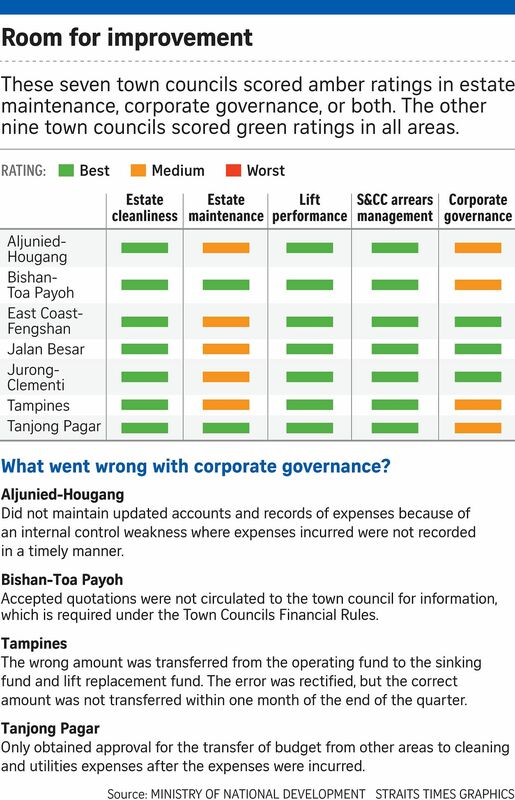 In the area of corporate governance, amber ratings were given to Aljunied-Hougang, Bishan-Toa Payoh, Tampines and Tanjong Pagar. MND said that AHTC's amber rating for corporate governance was given for the same reason that the auditor had qualified its financial statement. In Bishan-Toa Payoh, accepted quotations were not circulated to the town council for information, which is required under the Town Councils Financial Rules, while in Tanjong Pagar, the approval to transfer the budget from other areas to cleaning and utilities expenses was obtained only after the expenditure had been incurred. In Tampines, an incorrect amount was transferred from the operating fund to the sinking fund and lift replacement fund. Although the town council had identified this error and rectified it, the correct amount was not transferred within one month after the end of the quarter. MND said that it has been reviewing the indicators in the Town Council Management Report to see how they can better reflect residents' experience. For financial year 2018, it said that areas measured under estate cleanliness and estate maintenance have been updated to sharpen the focus on issues of public health, safety, and the living environment. "These include increasing the severity levels for observations such as overflowing refuse in bin chutes, and adding new items such as snapped or dangling tree branches," it said. "The remaining indicators are being reviewed progressively and details will be announced when ready."